An accommodation platform off the northwest coast of Norway was being evacuated on Wednesday after it started to tilt in the early morning hours. Helicopters were sent out to the platform from the nearest mainland base at Kristiansund. 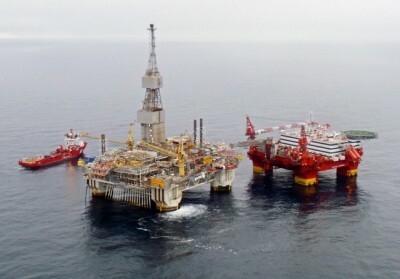 Norwegian Broadcasting (NRK) reported that 374 offshore workers were being evacuated from the Floatel Superior that lies adjacent to Statoil’s Njord A platform in the Njord oil field. The Floatel Superior, on which the workers live while on duty at Njord, reportedly started taking in water in one of its ballast tanks at around 4am, which eventually caused the platform to tilt to one side. A Statoil spokesman said the platform later was stabilized by pumping water into a tank on its opposite side, but a hole was discovered in the ballast tank that had taken in water. That led to a tilt of around 3-4 degrees. The Njord field lies in the Norwegian Sea due north of Kristiansund and west of Steinkjær in the southern portion of the offshore region known as Haltenbakken. It takes about 40 minutes to reach the field by helicopter from Kristiansund. Peter Jacobsson of the Swedish firm owning the accommodation platform, Floatel International of Gothenburg, said the rig had been inspected, that there was no further leakage and barriers were intact. He also said machinery on board the platform was functioning as normal. “There are 374 persons involved here, so we of course take the situation seriously, too,” Jacobsson told NRK. He said the platform was under control and, once evacuated, would be towed into Kristiansund for repairs. Emergency crews were standing by to assist in the evacuation, and in case the situation worsened. “We’re in close contact with Statoil and have a Statoil representative at the main rescue coordination center (Hovedredningssentralen) so we get constant information on developments,” said Stein Solberg of the center for southern Norway. Oil and gas production at the Njord A field already had been halted because of an equipment upgrade. No drilling was underway either, according to Statoil. For more information from Statoil, click here (external link).